Over half way through the competition, the remaining eight stepped it up during this week’s episode. One of “Glee’s” newest stars, Grant Gustin (Sebastian Smythe) came to the classroom as guest mentor for “Theatricality” week. Grant shared his stage experiences and spoke to how they helped shape his career as an on-camera actor. During last night’s episode, the group performed “I Hope I Get It” from the musical “A Chorus Line” for homework. The contenders then went to a supermarket for a very elaborate and theatrical music video performance of “When I Grow Up” by The Pussycat Dolls. After being given a pop-star to embody for the video, certain performers shined such as Ali as Katy Perry, Shanna as Lady Gaga and Aylin as Madonna. However, others not so much, including Lily Mae as Cyndi Lauper, Abraham as David Bowie and Nellie as Britney Spears. After singing Melissa Etheridge’s “I’m The Only One” during her last chance performance for Ryan Murphy, Nellie Veitenheimer age 19 of Tacoma, was not called back. 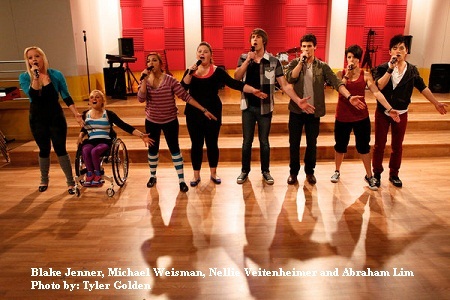 Nellie grew tremendously throughout her time on “The Glee Project” as she faced Ryan Murphy multiple times and performed a sincere last chance performance of Foreigner’s “I’ve Been Waiting For a Girl Like You” with Blake Jenner during “Adaptability” week. Nellie struggled with displaying her confidence in the large group numbers and got sent home. Nellie has been performing for eight years and in addition to singing, she can play the piano and guitar. Nellie also writes her own original songs and has a strong love for the arts. In addition, Nellie holds a passion for photography and is currently a member of a local swing band in her town. She was discovered for “The Glee Project” through an online video submission. Next week on Tuesday, July 24th at 10pm ET/PT, one of the leading ladies of “Glee,” Amber Riley (Mercedes Jones), will guest mentor the contenders for “Tenacity” week where they perform “Survivor” by Destiny’s Child.